The manner by which silver is heated until red hot and then quickly cooled so it can be safely worked without splitting. An apostle spoon will feature a figural depiction of one of Christ’s apostles on the termination of the handle. Such objects originated in the 15th century in sets of 13, and then featured a “Master” or “Saviour” spoon depicting Jesus Christ. They have become a popular christening gift for a godchild. A decorative panel most commonly in the form of a paper scroll or a shield used to frame a coat of arms. A sprinkler with a perforated cap used for the sprinkling of salt, pepper or sugar. 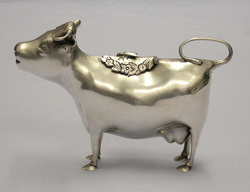 A cream or milk jug manufactured in the form of a cow. The tail forms a loop shaped handle and the mouth of the cow becomes a spout. Such items are most notably encountered in the works of P. G. Wodehouse. A decorative frame for holding condiment bottles and casters. 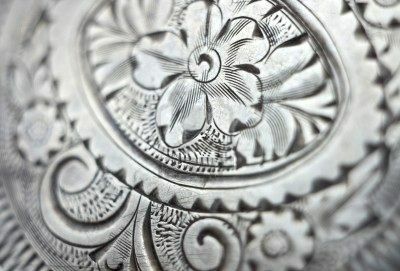 Decoration in the form of fine lines which are hand cut into a silver object. Refers to the removal of an engraved coat of arms from an existing piece of silver, often to allow a new armorial device to be applied. A decorative knob which may take one of many forms, such as an acorn. Technically this term refers to any “flat” objects, but is generally used in direct reference to cutlery. Refers to any objects that are essentially “hollow” such as teapots and coffee pots. A decorative geometric shape of diamond form used as a basic unit within a frieze or border. A large flat dish used as a tray, but without handles. 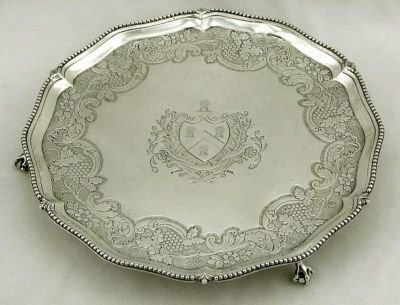 Occasionally a layer of gold will be applied to silver ware, often as a form of decoration or more usually as a form of protection. This is most commonly found on the interior of salt cellars, wine glasses and communion chalices as defence against the corrosive properties of wine and salt. 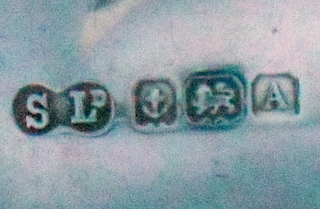 Our expert explains the basics of what to look for in English Hallmarks, with an introduction to the Standard, Town, Date and Makers mark.